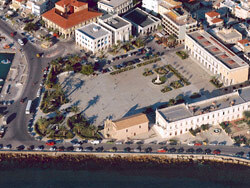 Solomos Square is the main square of zakynthos town , it is named after solomos whose statue is in the centre of it and is the national poet of greece who wrote the national anthem. 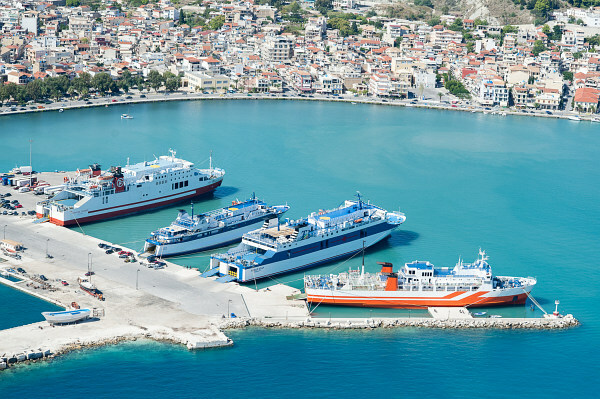 Around the square you will see some very interesting buildings , the museum of bizantine Art, the church of St Nicholas, the cultural centre of zakynthos and the library. The Byzantine museum of Zakynthos is at solomos square , here you will admire the big selection of paintings from the byzantine times , greek and byzantine sculpture from the 19th century and many icons from different churches of zakynthos , these are all works of great artists such as Doxaras, Katouzis , Tsanes , Kandounis , Damaskinos. At the ground floor there is a model of the town of Zakynthos before the earthquake in 1953 by John Manesis. 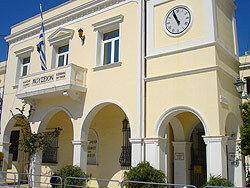 The Museum is located in Zakynthos in the historic Piazza San Marco. The ground floor houses the Mausoleum which from January 17 1968 host bones of the national poet of Greece Dionysios Solomos, Andreas Kalvou and his wife. 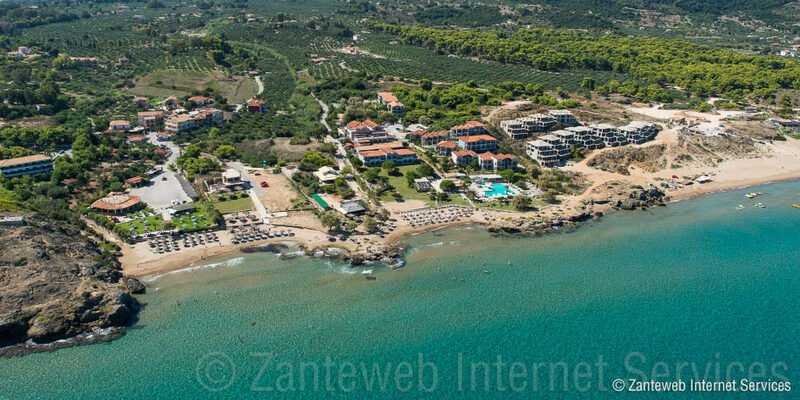 The floor of the building includes classrooms, Dionysios Solomos, Dionysios Romas, Nicholas and Thalia Koliva and Wing Eminent Zakynthos, the Hall Foundation Panagiotis and Effie Michelis, which continues in the new part of the ground floor. Between the two floors opened a small room with the works of Amalia Ntagianta, while the second floor function room of the Stavros S. Niarchos the Library and Documentation Department. 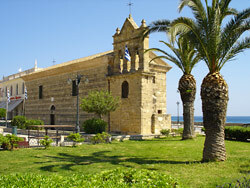 The church of St Nicholas was built in 1561 and is the oldest building on solomos square, it is the only venetian building saved up to today. 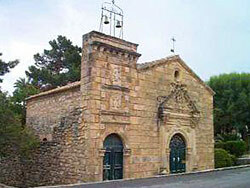 The church has very important historical value as the patron saint of the island served as a priest here. 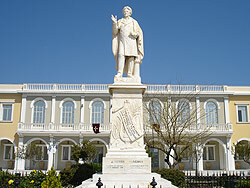 This is the statue of Dionisios Solomos. 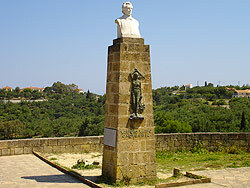 Solomos was the poet who wrote the national anthem of greece, an anthem of freedom. 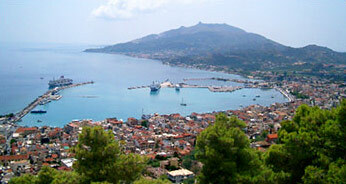 Bohalis is one of the prettiest suburbs in zakynthos. 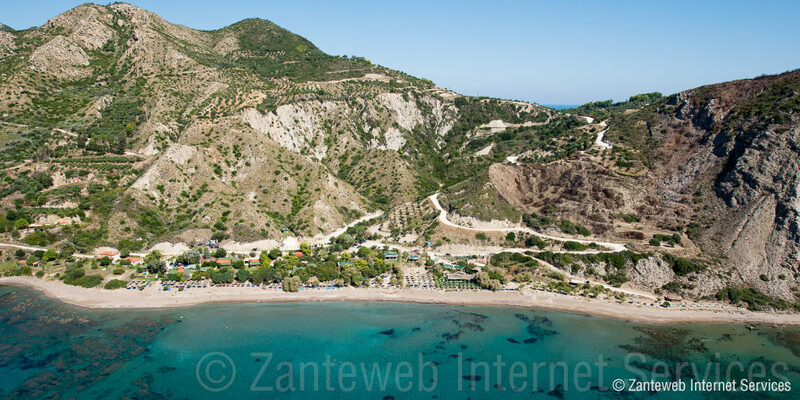 The little village is built around the hill which overlooks the town below and where the old venetian castle is situated. Here in the old times there was the capital of the island with the fortress around it. Most of the big mansions that were built here mostly are now destroyed. A walk around the narrow streets of the village is so pretty and takes you back to old times. 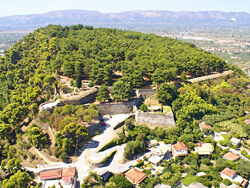 In the summer the area is full of visitors who come to enjoy the views of the town below . 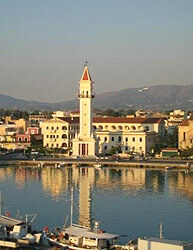 In the main square you will see the church of virgin mary chrisopigi with the high tower which is seen from all the areas of the island ,in the temple the icon of the virgin mary is stored and dated back to around the 8th century. 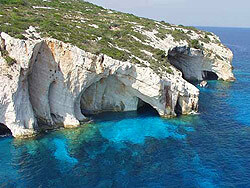 There are findings in the area of Bohalis which show signs of ancient temples of apollo and afrodite. The venetian castle is worth seeing , although very few buildings have survived the earthquake it is so nice to walk around under the pine trees, and the views from there are magnificent. Lofos Strani is the area where the national poet solomos wrote the anthem to freedom, looking across to the main land where the Greeks were fighting the Turks for their freedom. It is a very peaceful area and a very pretty walk. The mansion was built in 1660 by the English merchant and Consul of Great Britain Island Robert John Geoffrey. 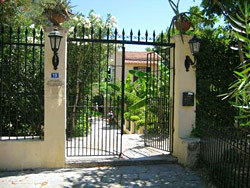 At around 1880 it was purchased by Alexander Roma housing members and the relics of the illustrious family of Zakynthos. Because of the earthquake of 1953 the mansion was severely damaged but was fortunate not to burn as the fire that broke out after the earthquake and devastated most of Zakynthos town. 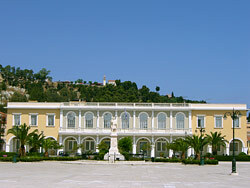 It is now restored and to date is the only large urban sample mansion house which has survived in Zakynthos. Since the summer of 2007 is has been opened as a museum so everyone can admire a unique remnant of the brave flower of the East and to help preserve the artistic treasures held there. 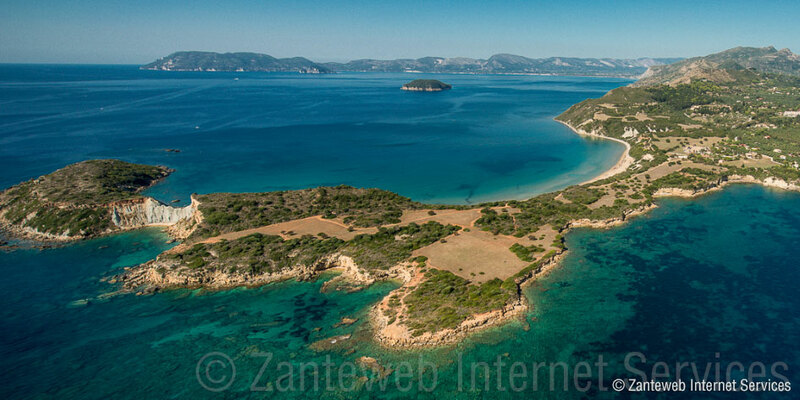 Among them we find a great gallery with rare specimens of the Ionian Islands in the 18th century. Paintings, sculptures, Venetian relics from the 15th to the 18th century, family heirlooms that are directly related to the modern history of Greece and a great library with more than 10,000 rare publications from the 16th to the 20th century, manuscripts, maps and prints can all be found here. 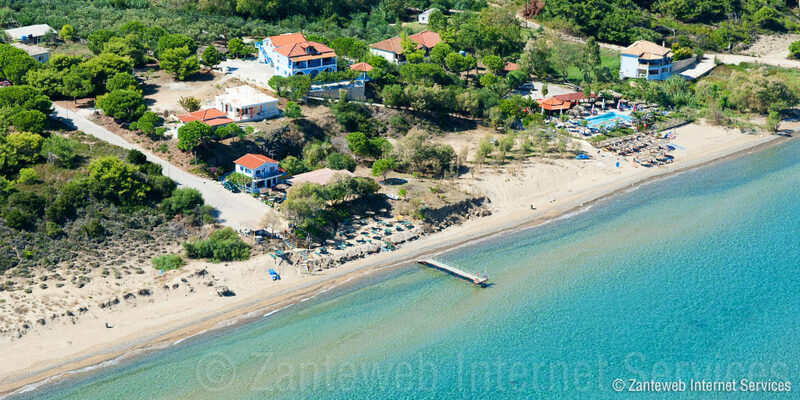 Saint Dionysios is the patron saint of the island, the zakynthians honor their saint twice a year with big celebrations and processions which are made in full spiritual atmosphere. This beautiful church started to be built just a few years before the catastrophic earthquake of 1953 , the church was one of three buildings in zakynthos which was not destroyed . The church is vasilika and the tower is very similar to the tower of st mark' s church in Venice, it is more than 40 metres high. Inside the church there is the body of the Saint kept inside a silver coffin, the church walls are all covered by paintings and the temple is wooden carved gold plated. 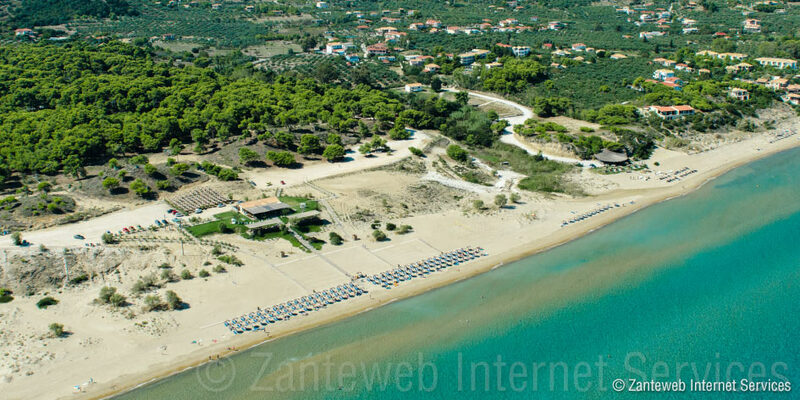 The life of Saint Dionysios He was born in zakynthos in 1547 and was the son of an aristocratic family. In 1568 he became a monk in Strofades monastery. 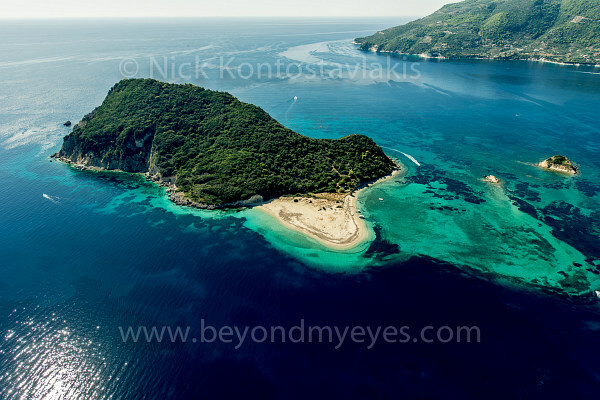 In 1577 he was throned as an archbishop of egina and came back to zakynthos a few years later, he remained a bishop of the monastery of Anafonitria and on the 17th of December 1622 he died. He was buried in Strofades island , when it was time to remove his bones , his body was found preserved and fragrant. He was named a saint in 1703. 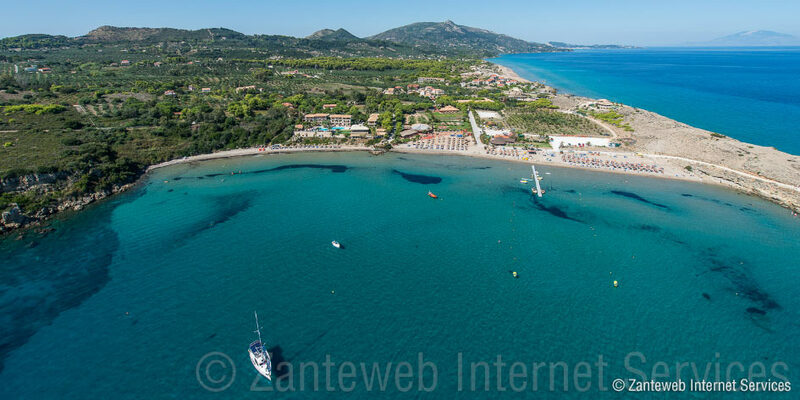 He is known as the saint of forgiveness because he forgave the killer of his brother , in august 1717 his body was brought to zakynthos to be protected by the pirates. In 1764 the body was placed in the church which was built on his honor. 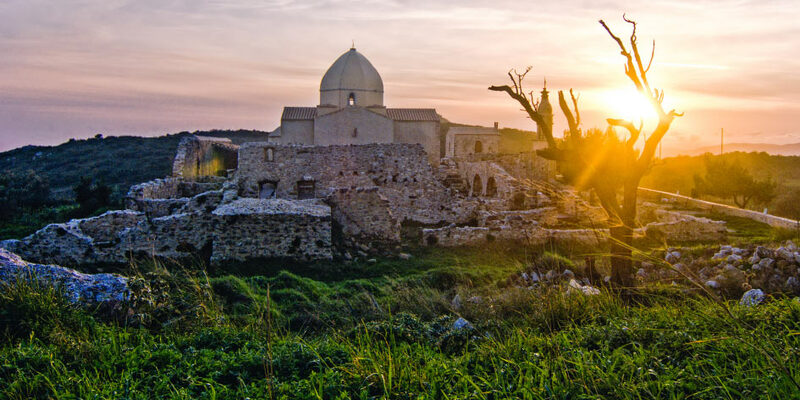 The zakynthans honor their patron saint with great celebrations ,one is held on the 24th august and the other on the 17th of december, the celebrations take place for 3 days , over these days the island is packed by thousands of people who come to pray to the saint and to honor him. The atmosphere is especially religious and there are different happenings which take place. A true copy of the famous Temple of Faneromeni destroyed by the earthquakes of 1953 and the fire that followed. Right from the sky in the church of the Virgin Birth of Law Doxaras, the work can be seen in the 18th Byzantine Museum of Zakynthos. 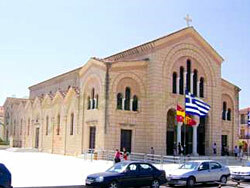 The church of Our Lady of the Angels is dedicated to the Presentation of Mary. 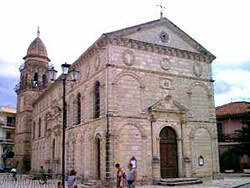 Built in the 17th century collapsed in the earthquake of 1953 but was restored to its original form. 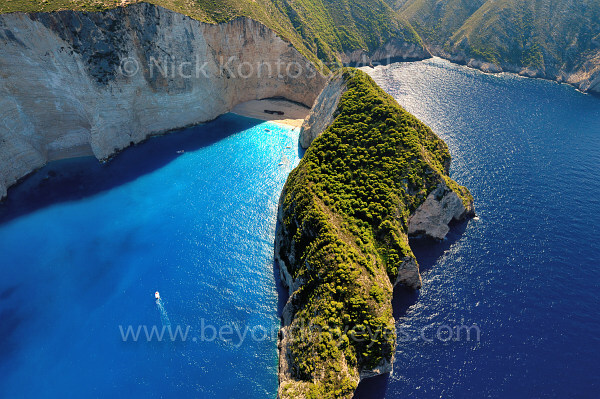 The blue caves is the 2nd most photographed area of zakynthos , they were discovered in 1897 and every year they attract a lot of visitors, they are at the most northern -eastern part of zakynthos at the area of skinari. The caves consist of many different caves , they take their name because of the color of the water which is a fantastic dark blue , very unusual. 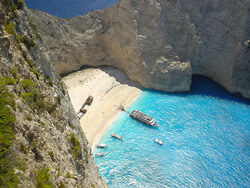 The shipwreck is the one of most photographed beaches in the world , visitors can see this in thousands of posters and magazines, the beach is only accessed by boat, there is a platform from above at the end of the cliff, from which you can see the cove you can get there from the village anafonitria by following the signs. In 1983 a boat which was passing by carrying untaxed cigarettes was chased by the coast guard and as the weather was very bad the captain and the crew left the ship to hit the shore and they disappeared not to get caught, the big waves just picked it up and placed it in the middle of the beach. 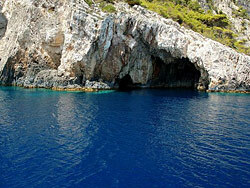 Keri caves are at the south- western part of the island they are also very spectacular with their funny shapes and sparkling blue waters which change to different colors with the position of the sun.